Sometimes after a significant earthquake, the Alaska Earthquake Center will publish a short movie showing ground motions recorded on seismic stations around the state. While these ground motion visualizations generally are more for display than for rigorous scientific study, a few interesting seismology tidbits can be seen when you compare different earthquakes side-by-side. This first movie contains four noteworthy earthquakes in 2018. In the top left corner is the M4.9 Hooper Bay earthquake on October 23. This event was widely felt throughout the Yukon-Kuskokwim Delta region and was by far the largest we’ve ever recorded in the area. Next is the M5.4 Western Brooks Range earthquake on October 14. While we didn’t receive any reports of this event being felt, it was the largest earthquake in the region in 30 years. On the bottom left, the M6.4 Kaktovik earthquake on August 12 (https://earthquake.alaska.edu/m64-kaktovik-earthquake-largest-ever-north-slope) was strongly felt in the Prudhoe Bay oil fields and attracted considerable local and national attention because of the proximity to the Trans-Alaska Pipeline (the Pipeline was not damaged in the event). Finally, the M7.9 Offshore Kodiak event (https://earthquake.alaska.edu/overview-offshore-kodiak-m79-earthquake) was hugely impactful for many Alaskans, whether from feeling the shaking, receiving tsunami alerts, or hearing the evacuation sirens go off. In seismology, we often point out that the magnitude scale is logarithmic - a fancy way of saying that the amount of energy released by an earthquake goes up very rapidly with increasing magnitudes. The general rule of thumb is that as you go up a magnitude unit, the amplitude of shaking will be 10 times larger and the amount of energy released will be 32 times greater. The USGS has an easy-to-use calculator to see for yourself how two different magnitudes compare (https://earthquake.usgs.gov/learn/topics/calculator.php ), and our sister network in the Pacific Northwest has a nice overview of magnitudes on their website (https://pnsn.org/outreach/about-earthquakes/magnitude-intensity ). Comparing these four earthquakes, you can see this magnitude relation in action. The Hooper Bay earthquake was felt by people all around the epicenter, but the energy from the event never really makes it out of southwestern Alaska and decays within a few minutes. However, the Brooks Range M5.4, despite being “only” 0.5 units bigger in magnitude, is recorded across the state. Why? Primarily because it released over 5 times the amount of energy. And the M7.9 Offshore Kodiak earthquake is not only recorded statewide, but the energy can still be seen on seismometers 10 minutes after the start of the earthquake. It makes sense when you realize that Offshore Kodiak released 31,000 times more energy than Hooper Bay! In this animation, we have four earthquakes that are all approximately the same size, a magnitude 5. The differences in the this case are in location and depth. The earthquake in the bottom left, near Talkeetna on July 9, was 70 miles deep. We’ve long observed at the Earthquake Center that deeper events in south-central Alaska are felt by folks across a wider area than shallow events, and the animation clearly shows why - the energy is recorded across the entire mainland and the strongest shaking is more widespread than with the shallower earthquakes. You can also see that the Kaktovik aftershock (bottom right) is recorded in much of the state, but not really in the southwest - much like how the energy from Hooper Bay doesn’t leave the southwest. In both cases, the explanation is the same - it’s because of the large-scale geology of the state and the physics of earthquakes. Much of Southwestern Alaska is overlain by large amounts of loose silts with hard bedrock outcrops few and far between. These kind of sediments have a peculiar duality - they can locally amplify shaking, but seismic energy doesn’t travel very easily through it (seismologists would say that the sediments have a low seismic velocity and a high attenuation factor). 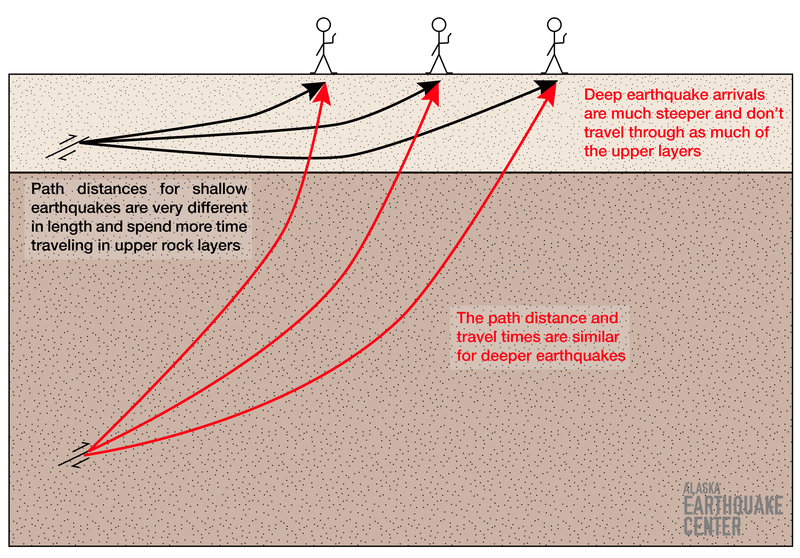 Because the earthquake was very shallow, the energy had to travel through these sediments for most of its path to the surface and as a result, the energy decays before it reaches the central part of the state - meaning that areas that feel strong shaking tend to be relatively close to the source. On the other hand, the Talkeetna earthquake occurred on the subducting Pacific plate deep beneath the state. More of this energy travels vertically, compared to a shallow crustal earthquake. The energy travels quite a bit of distance through the upper mantle, which generally has a high seismic velocity and a low attenuation factor, at least compared to the uppermost crust. The result is that similar shaking intensities are felt by people across a much wider area surrounding the epicenter than for shallow events. The figure below shows this phenomenon graphically. The details in these explanations are of course more complicated than presented here, but they are a rich source of scientific research - variations in seismic velocities, energy propagation, directionality, and earthquake ruptures are all clues that help inch us closer to better understanding the complicated and varied seismic hazards throughout our state.